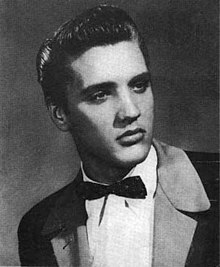 ^ Although some pronounce his surname（英語：Presley） ['prɛzli] (PREZ-lee), Presley himself used the Southern American English（英語：Southern American English） pronunciation, ['prɛsli] (PRES-lee), as did his family and those who worked with him. The correct spelling of his middle name has long been a matter of debate. 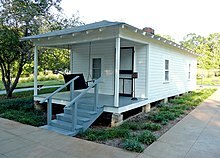 The physician who delivered him wrote "Elvis Aaron Presley" in his ledger. 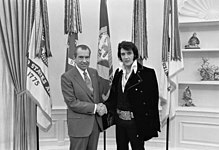 The state-issued birth certificate reads "Elvis Aron Presley". The name was chosen after the Presleys' friend and fellow congregation member Aaron Kennedy, though a single-A spelling was probably intended by Presley's parents in order to parallel the middle name of Presley's stillborn brother, Jesse Garon. It reads Aron on most official documents produced during his lifetime, including his high school diploma, RCA record contract, and marriage license, and this was generally taken to be the proper spelling. In 1966, Presley expressed the desire to his father that the more traditional biblical rendering, Aaron, be used henceforth, "especially on legal documents". Five years later, the Jaycees citation honoring him as one of the country's Outstanding Young Men used Aaron. Late in his life, he sought to officially change the spelling to Aaron and discovered that state records already listed it that way. 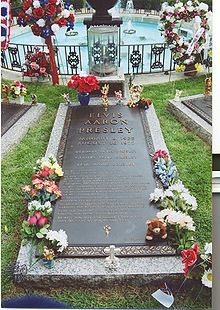 Knowing his wishes for his middle name, Aaron is the spelling his father chose for Presley's tombstone, and it is the spelling his estate has designated as official. ^ 艾維斯·普里斯萊1953年–1955年：The Hillbilly Cat. [2016年11月13日]. （原始內容存檔於2010年9月21日）. ^ Nash 2005, p. 11. ^ Adelman 2002, pp. 13–15. ^ Reaves, Jessica. 每週人物：艾維斯·普里斯萊. Time. 2002年8月15日 [2009年12月26日]. ^ Victor, Adam. The Elvis Encyclopedia. Overlook Duckworth; 2008. ISBN 1-58567-598-9. ^ Semon, Roger; Jorgensen, Ernst. 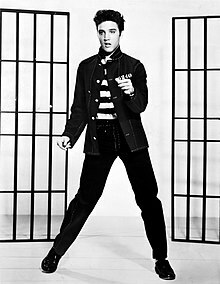 elvis.com.au. 貓王是最暢銷的錄音藝術家/發片歌手嗎？; 2001年12月12日 [2011年2月4日]. ^ Collins, Dan. CBS News/Associated Press. 貓王有多強？; 2002年8月7日 [2009年12月27日]. ^ 基里亞齊斯, 斯特凡. 貓王今天80歲了：在這裡觀賞他十個最為轟動的表演. 每日快報. 2015年1月8日 [2015年1月28日]. ^ Rocklist.net...《Q》雜誌列表... 《Q》 - 史上100位最偉大的歌手. 2007年4月 [2016年11月5日]. ^ Rollingstone.com...《滾石》雜誌列表... 《滾石》 - 史上100位最偉大的歌手. 2007年4月 [2016年11月6日]. ^ RollingStone.com...《滾石》雜誌列表... 《滾石》 - 史上最偉大的100組藝術家. 2007年4月 [2016年11月6日].